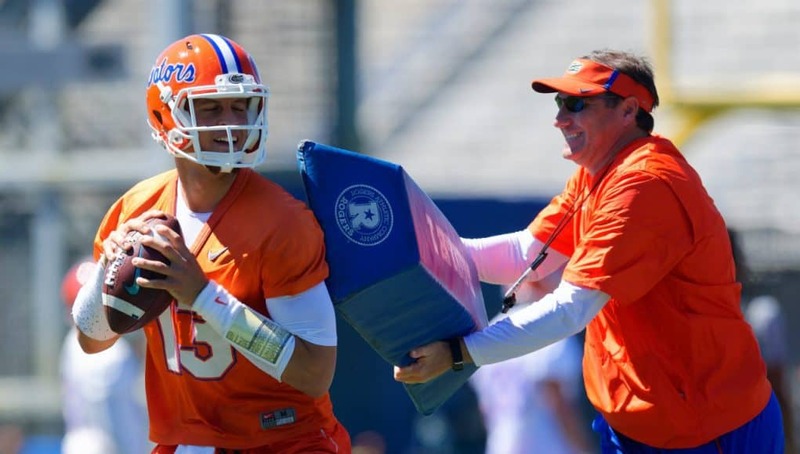 GatorCountry brings you a new podcast as we recap Florida Gators spring practice for week number two as we talk about how the players are doing under Dan Mullen. Andrew Spivey and Nick de la Torre break down which positions are doing well on offense and defense, plus how the practices are different under Mullen. Andrew and Nick also talk about how recruiting is different under Mullen and recap the new facility news that was announced on Friday. Andrew: What’s up, Gator Country? Your man, Andrew Spivey, here with Nicholas de la Torre. Nicholas, lot of things going on over the weekend, and it’s another busy week in Gainesville. Let’s not forget, it’s Opening Week for baseball. Nick: Yeah. Let’s see. Last weekend, little recap, Florida wins two out of three against Arkansas, after losing on Friday. You’re always surprised when they don’t a game that Brady Singer starts. Andrew: Yeah. Softball, of course, plays on Monday night. We’re taping this on Monday, so we’re not going to be able to recap that. Florida’s 2-0, 3-0 on the week. They beat Jacksonville, and then they have the two games against A&M so far. Excuse me, they beat South Florida. You guys beat Jacksonville. Then Georgia loses a game, so Florida’s now right in the top of the SEC standings. Just a game behind South Carolina, who’s played three less games in the SEC. Everything seems to be going well. Gymnastics, they kind of had a good meet, except for a couple flaws, and they ended up finishing third in the SEC Gymnastics Championship. Overall, good week. Good week of recruiting. Good week of spring practice. Nick: Florida will play Florida State in Jacksonville this week, so that’s always a fun one. Then Vanderbilt comes in over the weekend. Andrew: Florida has a non-SEC weekend this weekend in softball. With Vanderbilt not having a team, you always have one weekend throughout the year that you don’t play an SEC series. That weekend will be this weekend for Florida. They’ll host a few teams in kind of, I guess you could say a mini tournament this weekend. Then they’ll tilt it back up as they get ready to finish the SEC play. I mean, when you talk about SEC play, Nick, not only in baseball, but softball, South Carolina is really good this year. You look at what Mississippi State is doing this year. This is a really good SEC conference. Florida started the RPI that was just released last week fifth in the RPI. I mean, when you think about it, it’s going to go way up. Texas A&M is #8 in the country, and Florida may very well sweep. You got Alabama. You got South Carolina. You got Mississippi State. You got LSU still to play. You got top 10 teams. That RPI is going to be way up there. Nick: Yeah. I guess for Florida there’s times, I almost think for Florida it doesn’t even matter. I don’t know Florida’s RPI right now. Andrew: What does it matter? Nick: Just because they’re not going to be a team that’s like on the bubble to get into a regional. Yeah. Just by the sheer fact of who they’re playing, and who they have to play, absolutely. Andrew: Yeah. It goes the same way with you guys over in baseball. It doesn’t matter, because you’re going to get in. Especially this year with softball, there’s a few good teams out in the Pac-12, and Florida has taken a loss already to Georgia, #6 team in the country right now. When you look at being one of those top teams to host through the Super-Regionals, that’s kind of where the RPI comes up. It may end up being a factor for baseball as well, but you want to have that high RPI. Again, baseball and softball both doing well. Nick: Then we had an open practice on Saturday. The schedule this week is there’s practice Monday, Pro Day Wednesday, and there’s a scrimmage that will be open to us, to the media, no photos or videos, but that will be open to us on Friday. Andrew: Let’s dive into that, Nick. Give me your recap of last weekend’s spring practice. Overall it seemed like a much cleaner week for the team. Go ahead and give me your overall, just kind of let’s start it off as give me your overall assessment of the offense. Did it clean up last week? Nick: Yeah. I think what I’m seeing from the offense, really I think my most improved unit might be the receivers. The quarterback race is clearly right now Franks and Trask, splitting reps with the ones. Then Jake Allen has kind of taken some three reps, with Emory Jones going fourth. I’m just not seeing it in terms of accuracy and footwork from Jones right now. Clearly, if you’re out there, and you’re watching how the reps are going, it’s a big distance between Franks and Trask and then the other two quarterbacks. Andrew: Let me start to talk with you about this. This is something you and I have talked about off air, and a couple times with Emory. Emory struggled a little bit at the Under Armour game with different things. He would miss high. That was the miss he would make the most was high. You and I talked about this. It’s mechanics. I think you would agree with me in that Emory knows where to go with the ball, and there’s times where he makes a perfect throw, but the one thing that I’ve noticed the most out of Emory is his footwork. That is if it’s a three step drop, he’s almost taking a three and a half step drop at times to get to where he needs to be, and then that’s allowing the rest of his body to be out of sync a little bit. Maybe forcing him to throw maybe off his back foot more than you would want. I personally, again, I could be totally wrong on this, but I personally believe Emory’s problem is just simply mechanics and footwork right now. Nick: That could certainly be it. I’ve said to you before, is that a one month fix? You’ve got however long you’ve been playing football, that many years of muscle memory built up. Is that a one month fix? Does it need a year? Does it need two years? You get into that. Right now, not giving up on him or anything like that. I know people will freak out, unless we say he’s the best thing that’s ever happened to the University of Florida. There will be some people that freak out about that. He’s young. He should still be in high school right now. I really like the coaching staff in terms of watching them work, how technical they are. I think he’s in good hands with Dan Mullen and Brian Johnson. Andrew: I think that’s a big thing. When you look back at what Emory’s done, he’s been on a team and in high school where he was just that much better of a player, and he was able to kind of get away with things. The one thing that is true right now, and it sticks out the most, is what kind of athlete he is. He is a phenomenal athlete. He’s a guy that is going to be very special with his legs. Again, I think and believe that you’ll see Emory worked into the game plan some way or another, even if it is just simply a wildcat quarterback. I believe that you’ll see him play somewhat, somewhere, and have some kind of package for him. Again, it’s one of your things, like you said. It’s kind of what we talked about with Tebow before. How do you change something that you’ve been doing your entire life? Nick: Right. I think that might be, if he had like a weird delivery, that might be worse than just cleaning up footwork. That’s just technique and repetition. I’m not worried. Not time to push the panic button there. I still think you’d be okay with Franks and Trask. The only thing that I wonder about is we’ve talked to a lot of players, and they keep saying there’s a lot more RPOs, and we haven’t seen that quick, concise decision-making from Feleipe Franks that you would want to have in a quarterback when you’re giving him the option to read a defense and decide whether you’re going to be running or passing on any given play. Andrew: Yeah. Nick, you know this as well as I do, and that is a quarterback’s confidence can do a lot of things. We talk about it. You and I are both big baseball guys, and it’s crazy what a Texas leaguer will do for a hitter’s mindset. That’s exactly what it is for a quarterback. I was the biggest critic on Franks last year. That’s no secret to nobody. After seeing and hearing a couple things, I’m almost at let’s see what he does this fall a little bit before I say just how bad of a quarterback he was last year. Simply because of what we just said about Emory Jones, and that is he’s got real coaching. Nick: Yeah. I’d say the same thing. Probably say the same thing with the tight end groups now and the running backs. I think the running backs have had good coaching, but Greg Knox, he knows his stuff. I’ve been very impressed through practice. Stuff gets cleaned up right away. I feel like every practice I went to with McElwain it was just I’m telling you about receivers dropping passes on air, and it’s just like at what point do you stop running a drill, because your team can’t do it, or get them to fix it? It just never happened. When stuff goes wrong or isn’t going as expected in practice now, the drill is stopped. There’s cursing, and it gets fixed. Andrew: Right. Here’s the thing. It’s what spring practice is for. You fix the fundamentals in spring practice. You fix the fundamentals in fall camp. You don’t have time to work with Josh Hammond’s route running or Emory Jones’ mechanics or Martez Ivey’s footwork before you play LSU on Monday. It just doesn’t work like that. That leads me to kind of my next point, and that is I like the way Billy Gonzales has taken things back to Step 1 with the receivers. That is working with the footwork, working with the cutting, working with everything that you do with the ball in your hands, before they ever touch the ball. Getting the small things worked on to where when they catch the ball it’s almost natural what they do with the ball in their hands. You and I talked about this, and we talked about it several times. Once a receiver, if they caught the ball, they were almost going down to the ground. There was no ability to make nobody miss. There was no getting north and south. It was how quick were they going to get to the sidelines, or how quick were they going to juke someone. It was bad. You and I loved the stand pass under Mac, and I still do, but it was a play that, outside of a few guys, it was going to get what they could get. There was going to be no extra yards gotten by the receivers. Nick: No. No, there certainly wasn’t going to be. That’s a group that I mentioned that is probably most improved. I’ve been impressed with Rick Wells and impressed with the way he, first off, he’s big. He’s big. He’s definitely put on some size, and I think he’s using that, specifically when defenses are playing press or when a defensive back tries to get physical with him. It’s something that Trevon Grimes does really well also. It’s just knowing that that’s probably my biggest advantage is my size, and I’m going to use that to create space. That’s another thing Billy Gonzales is working on. We’re creating space. How many times did we talk about the receivers not getting any separation last year? Andrew: It seems like every ball was contested. It seemed like, and it wasn’t even that it was a bad route. You and I talked about this. Mac had some good play calls, some good designs at times, but it was, like you said, the guy didn’t get off, or even if it was a perfect pass, it was able to be broken up. That’s a big thing. We all joke about how the slant pass wasn’t in the arsenal for Florida, but if you can’t beat the press at the line of scrimmage and create separation, the slant’s not going to work anyway. Nick: Exactly. Obviously, I say they’re the most improved group, but I make that statement as that saying that I’m watching Van Jefferson and Trevon Grimes too. If you take those two out of the equation, they are, again, not the most improved group. Andrew: Again, I’ll say this. It’ll all come to fruition when you have a quarterback throwing them the ball. The quarterback leading them open or a good offense can make a receiver look really good. I mean, how many receivers in the country who I would say maybe aren’t the best players in the world, but their offense allows them to be. That just kind of is what it is there. Go to defense, Nick. Who’s looking good on defense so far? I know you talked to me personally about Jachai Polite. Nick: Yeah. Jachai Polite, he’s been playing in that role, I’m not sure what they call it, it’s the outside linebacker. They have a name for it. We need to ask after practice. Basically, playing that rush linebacker off the edge. A reporter had asked, when we talked to Nick Savage, it looks like Jachai Polite’s slimmed down. If you look at him, yeah. You and I were talking the other day about we saw him before he enrolled at Florida, and we thought, he’s going to grow into a defensive tackle. He kind of looks chubby. Not the case anymore. Savage told a reporter, body composition is strange, because he’s actually gained three pounds, but he looks so much different. He’s been a monster off the edge. Not just speed, he is strong. I’d look for him to push Cece Jefferson for reps and playing time. Those two are kind of playing that same spot there. He’s been one of the most impressive players, to me. I would say the next most impressive player to me, on the entire defense, would be Trey Dean. Just, in my opinion, because of how good he’s been and how young he is. Andrew: Right. To go back to that, they’re calling it the buck again, Nick. That’s what Grantham and those guys are telling recruits. They’re calling it the buck, like Will Muschamp did. Nick: I think he called it the star before, and I wasn’t sure if the star was that Chauncey Gardner role, which is kind of like a safety/linebacker/nickel kind of thing. Andrew: Yeah. That hybrid guy. To go back to that, here’s my thing, Nick. I wonder, when it gets into game time, if it’s 2nd down, or if it’s 3rd and short, I wonder how much they go to the buck, or how much they bring in a guy like Jeremiah Moon to play that outside linebacker spot, and then have a Cece or Polite rushing the edge on the weak side. I think that having Cece and Polite, those guys doing that, I think it’s just creating versatility. I think that it’s something that when you look at the depth at the linebacker position it is depleted for the most part depth wise, why not have those guys playing that? Like you said, if Cece and Polite can do it, I mean it’s a standup defensive end basically. You’re getting a free reign at the quarterback. Nick: I agree with that. For me, I think defensive tackle is another position where you’re going to be okay. Andrew: Right. Well, you’re missing Kyree too. Nick: Yeah. You’re missing Kyree right now, but I think right now starting you’re okay with the guys you have. You’re okay with a Khairi Clark. I like TJ Slaton. I need to see more from Elijah Conliffe, because right now Luke Ancrum is playing, is starting. That’s not what you need. Nothing against Luke Ancrum, but if Elijah Conliffe and TJ Slaton are going to be the players that we think they can, then Luke Ancrum shouldn’t be playing. Andrew: Right. Again, like I said, I think that he’s a little out of shape, and that’s something you need to see from him. Once he gets in better shape, what can he do? I mean, you look at some of the defensive linemen that we’re talking about now, those guys all have gotten in better shape. I think that’s a big, big key for me with Dean. Nick, I can’t say I’m surprised. That guy dominated Under Armour week. He is a physical specimen when it comes to just locking you up. He’s not the biggest guy in the world, but he’s strong. When he gets his hands on you, chances are you’re going where he puts you. Nick: Yeah. It’s hard to go to a practice and not at some point while we’re out there, multiple times even, hear a coach yelling praise at something that Dean just did. He’s been so impressive that I’d say he’s your third cornerback right now. Obviously, Marco Wilson and CJ Henderson have had good camps, and those are your starters. Chauncey’s in the nickel, but when one of them comes off the field, I think Trey Dean’s the guy that goes in right now for you. Nick: No. Not a bad thing at all. Not at all. At safety, I feel comfortable with Jeawon Taylor. He’s no contact right now, but a very smart football player. I’m okay with Brad Stewart. I still need to see more from him though. Andrew: I feel good on Brad getting it as well. I want to hit on Jeawon a second. Listen, everyone knows I’m a little partial to my Bama guys, but you and I talked about this last year. I know you don’t want to admit this, and that’s cool. You and I have talked about this off the air, and that’s cool. The partiality shown against guys like Jeawon Taylor by Randy Shannon killed these guy’s confidence. Guys like Jeawon, I don’t want to say gave up, but it was a situation where it didn’t matter what they did. They weren’t going to see the field under Randy Shannon. He didn’t like those guys. They weren’t from South Florida, and they weren’t his guys. Those were Geoff Collins guys. Confidence is back with those guys. Jeawon was recruited by Mullen, was recruited by Grantham and those guys. Jeawon’s getting a chance to show what he can do. You and I have talked about this before. Jeawon’s not going to be Keanu Neal and knock your head off. Jeawon’s not going to be Major Wright or Reggie Nelson and lead the country in interceptions. That’s not Jeawon Taylor. Jeawon Taylor’s going to be a guy that’s going to be where he’s supposed to be, and he’s going to make the play. I don’t think he’s as athletically inhibited as Nick Washington was, and that’s nothing against Nick Washington. Nick Washington did what he was supposed to do. I think Jeawon’s a better athlete than Nick, but he has that same mindset of he knows where he’s going to be. Jeawon’s stepping up to be that leader. You talked to me about it as well. You said Jeawon’s a guy that’s making those guys laugh. Those guys are looking up to him, like you want a safety to do. Nick: Yeah. He’s totally come into his own in terms of confidence. He’s the guy that when you’re at practice you can’t miss him, because he is, I’m trying to think of who on a team it would be comparable to in recent years. If someone comes to your mind, let me know. Just getting guys up. Not just making them laugh, I’m not saying he’s being a class clown. He’s someone who bouncing around, and not just on defense, but bouncing around all throughout the defense, to the offensive players, and getting guys up. It’s a role where he can’t go through some of these drills when they’re hitting, but he’s making sure that he’s still engaged, and that other guys are engaged. Really just stepping up into that leadership role, which is good to see for a guy going into his junior year. Andrew: Nick, you know Jeawon. You’ve known Jeawon since the recruiting process, just like I have. That’s Jeawon Taylor. Jeawon Taylor is a guy that is going to make you laugh. There’s not going to be many times you speak to Jeawon Taylor that you don’t at least laugh or cut up with the guy, just because that’s Jeawon’s personality. He is not a clown, not a class clown, by any means like that, but he’s a guy that’s a funny guy, but also a very serious guy. Again, very glad to see that with him. In Grantham’s defense that’s going to rotate a lot between 3-4 and 4-3, you need someone smart back there to call plays at safety. Nick: Absolutely. We talk about it a bunch, but it’s probably the thing that gets overlooked the most when you are talking about that position, just the sheer fact of how they’re the quarterback and kind of making sure people are where they’re supposed to be and everything. It’s just a lot, and that’s something Jeawon Taylor can absolutely handle. Andrew: Exactly. We’ll move on from here. Nick: Real quick. I had mentioned Jeremiah Moon. He’s been behind Jachai Polite and Cece Jefferson, in that spot. Shawn Davis and Donovan Stiner are backing up at safety. Andrew: Okay. As far as the starting defensive line, run that down for me real quick. Nick: It depends on package. There’s times where it’ll be Jefferson, Ancrum, Clark, and I’m forgetting someone. Nick: Yeah. Sorry. Jabari Zuniga. Then sometimes they’ll be in a different package, and Slaton is with the first team, and they’re in more a true 3-4, with Slaton playing nose tackle. Ancrum’s been the guy on that first team playing tackle with Zuniga, being the end with his hand on the ground, and either Jefferson or Polite playing that rush spot, that buck. Nick: Linebacker, it’s Vosean Joseph and David Reese. People were saying on Saturday’s drill, I was just on a different side of the field, and they’re only supposed to be thudding right now, so Jefferson tackled somebody. Great tackle, but tackled him down to the ground, and Grantham just removed him from the 11-on-11 drill. A lot of people were talking about Rayshad Jackson stealing reps. That wasn’t the case. He wasn’t stealing reps. I think Vosean just got in trouble. Andrew: Listen, that’s a good trouble to be in. Nick: Yeah. Then your cornerbacks are, like I said, Gardner, Wilson, and Henderson. Then we just talked about the safeties with Edwards and Jeawon. Andrew: Yeah. Let’s kind of move on from that a little bit, Nick. I wanted to talk a little bit about recruiting. Once again, it was another big weekend. Mullen hosted several guys on campus again. Got several guys planned to come in over the next couple days, including one of the top quarterbacks in the country in Jayden Daniels from out in California. He’ll be on campus on Wednesday. Big, big-time quarterback. USC is a team to watch in his recruitment, just because he’s from Cali. People continue to ask me, how is recruiting going under Mullen? When you start to run down the list of guys who’ve come into town, and, listen, I’m not a five-star, four-star guy, but I do consider top 100 players. The amount of top 100 players he’s getting on campus, Nick, is incredible. It’s big to see the amount of guys he’s getting on campus, and it’s happening in a big way. Nick: Back to back weekends you’ve had the #1 and #2 running back. Andrew: Yeah. It’s a thing where, okay, you got them on campus. People are saying, what does that do? Listen, first step to getting these kids is getting them on campus. You and I, we talk about it all the time. It was nothing against Mac or anyone else, but they didn’t get these guys on campus very much. They didn’t get guys on campus enough early on in the process to start developing that relationship. Getting them on campus just for an official visit is worthless. I mean, I shouldn’t say worthless. That was premature on my part. It’s almost one of those things where if you only get him on campus once, your chances of getting them are not very good. Nick: We always say, don’t follow the tweets. Follow the visits. Andrew: There you go. They had another big defensive end in the country, Khris Bogle, from down in South Florida. He’s on campus. Miami, Florida State, and Florida are some of his top schools. He chose to visit Florida over the Miami Junior Day and FSU Junior Day. Again, another big visit. Like I said, this coming week they’re going to have Bogle on campus. They’re going to have Matt Elam’s nephew, Kaiir Elam, the DB, on campus. They’re going to have offensive line commit, Wardrick Wilson, on campus. They’re going to have another quarterback on campus, Sam Howell, out of the Carolinas. He’s going to be on campus. Just back to back to back weeks of just loading up on big-time players. The following week, they’re going to have one of the best running backs in the country, Sean Dollars, out of California. Five-star running back, according to a lot of people. Listen, are they going to land the #1 class in the country? Who knows. But it’s not going to be without trying and not getting kids on campus. Again, that’s the first step. Nick: What is the spring game, what is that list looking like? Andrew: It’s huge. You look at a lot of instate guys coming on campus as well. A few out of state guys. Of course, it’s early on to know about those out of state guys. So far, the numbers that are talking about coming in are big, and some big-name guys. Keon Zipperer is coming in, the tight end. Brendan Gant, the Alabama commit. You have a couple of other instate guys. Derick Hunter is another guy that’s talking about coming back, the defensive end out of Miami. It’s expected to be big. Like I tell people all the time, you get guys in in the spring to build up to summer visits. Then summer visits build up to fall visits. The fall visits build up to official visits. It’s a pattern. We always talk about recruiting is a marathon, and you take it in different stages. Get him in on the spring. Set it up to get him in on the summer. Set it up to get him in in the fall. You just set it up. It’s a process. Nick: That, to me, is impressive just how many kids they’ve been able to get on campus early. The other thing that I like is I don’t think, no matter who’s been there, I don’t think anything has changed from a practice standpoint. You’re not seeing the team practice any different. It’s kind of like what Mullen said. We want to get kids on campus while we’re practicing, because this is how it’s going to be. If they see what we’re doing, and they don’t like it, cool. You might be the best running back, best quarterback, in the country, but if you don’t like the way we’re coaching these guys, we don’t want you here. Nick: It’s a culture change. We don’t want people coming just because they’re a 12-star middle linebacker. Listen, this is our linebacker coach. These are the drills we do. This is what you’ll be doing when you get here. If you don’t want to do that, we’re not going to make you do it. Find somewhere else to go. Andrew: It’s kind of what I talked to you about a little bit, and that is these guys are seeing the coaching staff coaching these guys up and seeing the change. Listen, these players are telling these recruits. This coaching staff is coaching us hard. I had a guy over the weekend tell me that a couple of the defensive linemen told him, “We didn’t practice hard under the former staff. This new staff is making us work hard.” That’s exactly how it’s going. Nick: The other thing, from a recruiting standpoint, the support staff, the recruiting guys, I’m watching them as they walk around with recruits, and walk away. The communication between them, telling other people, I’m with so-and-so. Do you see me over here? We’re going to walk that way. Take him. I see Major Wright’s over there. It would be good if Major Wright knew who this was, and could tell him, come be a Gator. Nick: The communication between those support staff guys on the field to make Florida look the best as possible to guys as they come on for their visit, I’ve been impressed with that, with that new support staff there. That’s something that wasn’t done in practice with the former staff. It was, “Go out and watch practice on your own and stand by your coaching staff.” No, no. That’s not how it’s done with Mullen. He has someone assigned to you. That’s the person that’s doing that. When a coach isn’t with you, a support staff member is with you. I can’t say it enough. If you got a guy on campus for four hours, you need to use that four hours to your advantage. This staff is using that four hours to their advantage. Nick: Absolutely. Really probably can’t say enough about how coordinated that whole thing is and how much goes into it. That’s been impressive for me to see from the recruiting end. Andrew: Yeah. Want to move on from that. Want to talk about one more thing, and it deals with recruiting. That is the facility plans. That broke on Friday. We’ll talk baseball and softball here in a second with those facility upgrades, but to get that standalone facility and look the way it does, talk about a huge recruiting tool. Listen, Mullen’s already using it. He was talking to kids about it this weekend, showing them the plans. In 2020, when you guys are sophomores, we’re going to have this brand-new building where we break the ground. You’re going to see it from start to finish. You’re going to get to enjoy it. That’s a recruiting tool, and they’re being used. Nick: It was funny. We started asking some of the players. I think some of the other reporters asked like juniors about it, and they’re like, “Yeah. It looks nice.” It’s not going to be here when I’m here, but plans look great. Andrew: Talk to me about what Scott Strickland and those guys said. Explain to everybody just the process, starting with baseball and softball, because obviously that’s going to be there. Nick: Coaches offices are on one levels, and players are on another. Now they have to go up to the third floor to go see a coach. Where do you put the food? When a player comes in, and when they leave, the first they’re doing is probably eating. Where are the weights now? If we’re going to put the food on the first floor, because that makes sense, where do you put the … It just becomes so disjointed, and the functionality isn’t there when you’re building a three-story building, just trying to cram stuff in. Nick: $20 million Band-Aid on baseball, and building a $45, $50 million standalone facility that isn’t optimally functioning, let’s just take a step back. Can we do baseball the right way? You’re building a brand-new, $50 million stadium. When you’re building from scratch, you can make that. You’re going to spend $50 million on baseball and not worry about it for another 30 years. Andrew: Right. And it gets all the bells and whistles. Nick: You’re going to be able to have that entire space now to build optimally functional standalone football facility that will be able to stand up to the Alabamas that have the 40,000 square foot gym, to the Clemsons that have the putt-putt and a slide and this and that. I don’t think Florida, in talking to Scott Strickland, I don’t think there’s going to be Bama’s waterfall or golden toilets or anything like that. I do think that it will be a state of the art facility that will help Florida in recruiting. It’s going to take longer than what they had previously expected, but you’re doing things the right way now. Andrew: Yeah. Like you said, you’re doing it the right way. You’re going to do all the bells and whistles that it needs to be. I like it. You do the thing with recruiting of having the new weight room, having the brand-new locker rooms, having the coaches’ offices, separating football from the UAA, separating football from the communications department. Having it by themselves, like most schools have. Listen, Clemson’s slide, that’s the cool thing. The barber shop, all that cool stuff. You couldn’t cram it into a small building. I don’t know what Florida’s going to put in it. I’m sure they have a barber shop. I’m sure they have something else cool put in there. They’re not even into that process of really thinking about that yet, because they’re not there yet. They’ll be doing that over the next year. You want to have space to have the cool things. That’s what they’re going to be able to have in this. Like you said, it’s going to be a recruiting tool. It’s going to be a recruiting tool for baseball. It’s going to be a recruiting tool for softball. Nick: Yeah. Softball will be the one that actually gets done first. That’s just a renovation, and they’re going to start right after this season, and they should be done before next season. It’s more seats. The big thing that Strickland is stressing with baseball and softball is being able to see the field from anywhere you are. Right now, baseball, if you go to the concession stand, you can’t see anything. There’s TVs, but can’t see the field. It’s really like a Minor League baseball stadium initiative that they’ve done with all these new parks, where I can go to the left field concession stand, and while I’m waiting in line I can turn around, and I have a view of the field. What they’re going to do to make that possible at softball is raise the press box, because right now the press box is right behind home. If you get up to go to the concession stand, you’re looking at the back of the press box. The press box is going to get raised, and now you’re going to have also a concourse that goes pretty much around the entire field, and no matter where you are at Pressly Field, you’re going to be able to see the game going on. The baseball field will have the same thing. Andrew: Right. Exactly. Anyway, big week. Big week this week again, as football continues spring practice. The Gators have Florida State. Softball has FIU this weekend. Big week of events, and then a big weekend, as the scrimmage, and then baseball and softball continue. Good things all around. Gator sports are doing well. Also had lacrosse get a win, had the tennis team doing well. Again, spring sports in Florida doing well. Nick: As they always do. Caeleb Dressel swimming faster than anyone in the country. Andrew: My God. What record did he not set this week? Nick: He’s the first person to ever swim under 18 seconds. Andrew: Nick, I don’t even know if you and I could get in in 18 seconds. Andrew: Good grief. Congrats. Congrats to him. Want to say this real quick, Nick. You and I have talked about this a lot. I don’t want to keep beating a dead horse, but Gator Nation of former athletes is a special group. I love the way Mullen’s bringing those guys in. It should be a who’s-who. Keanu Neal, Major Wright, Danny Wuerffel, Percy Harvin. You name them, last weekend they were there. That’s how it should be. Florida has some pretty damn good former athletes. Use them to your advantage. Nick: Yeah. They’ve been around. Major Wright was back in town, because he’s playing in the flag football with Daniel Wuerffel. You had Danny Wuerffel speak to your team about how no one player is bigger than the program. The guys that came before you have built this program, but it’s not even about them. It’s about what they’ve built. This is coming from a guy who has a statue of him outside the stadium. Telling them, you’re about to walk back to your locker room and pass a statue of me, and I’m sitting here telling you I’m not bigger than this program. You’re not bigger than this program. This program isn’t Tim Tebow. It’s part of what all of us, all the guys ahead of you, have done and built, but no one person is bigger than this program. To have a guy who has a statue outside the stadium addressing the team, everyone remembers Major Wright’s hit against Oklahoma in the National Championship. These guys that are speaking to the players, I think that’s great. 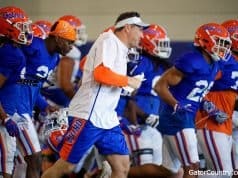 Maybe Jim McElwain did it some, and practices just weren’t open, and we weren’t seeing it, but that’s making a big deal. I think not just to the players, but to the recruits that are seeing it too. Recruits are meeting Percy Harvin. Andrew: Listen, it’s a situation, and I was a Mac fan. I don’t hide that whatsoever. No. He wasn’t friendly to the former players. His staff wasn’t friendly to the former players. His recruiting staff wasn’t friendly to the former players. It is what it is. You use them to your advantage. Those guys want to be around. You welcome them back with open arms and tell them, you’re welcome here. We want you here. Guess what? They’re going to recruit the best, because they want to watch the best. Nick: It helps that the best probably four or five years of Gator football, a lot of these coaches were here for that. Nick: Hevesy was here. Gonzales, Mullen. There’s a built-in relationship there with a lot of these guys already. Andrew: Vernell Brown is in the office. Yeah. Nick, we’re running out of time here. Tell everybody where they can find us. We’ll get out. We’ll see everyone on Friday. Nick: www.GatorCountry.com for all your Florida Gator news. The podcast is there in audio and transcript form. Subscribe on iTunes, and have it pushed right to you. Never miss an episode. Do your social media thing. @GatorCountry on Facebook and Twitter. @TheGatorCountry on Instagram. I’m @NickdelaTorreGC, and he’s @AndrewSpiveyGC. Andrew: There you go. Guys, we appreciate it. We’ll see everyone at the end of the week. Happy Opening Day to everyone on Thursday. As always, go Braves. Chomp, chomp.